I made this delicious tart for tea; it was easy to make as I used ready rolled puff pastry. If you can’t get taleggio you can use fontina or Camembert. Melt the butter in a shallow pan and add the sliced leeks. 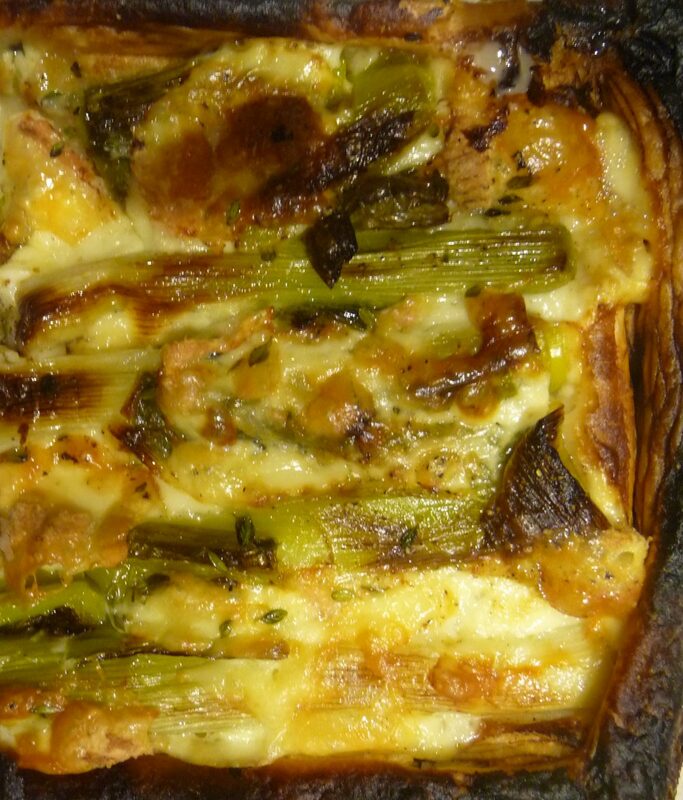 Cook the leeks slowly intil they are soft but not browned, this can take up to 30 minutes. Roll out the pastry until no thicker than a 10 p coin and place on a floured baking sheet. Score a border 2 cm from each edge and prick with a fork. Tip the leeks on to the pastry, pushing them almost, but not quite, to the border. Brush the rim with some of the leek butter. Slice the cheese thinly, then break it up into small pieces, tucking it in amongst the leeks. Scatter over the thyme. Bake in the oven at 220°C/Gas Mark 7 for 15-20 minutes until the pastry is golden and puffed and the leeks are browning.